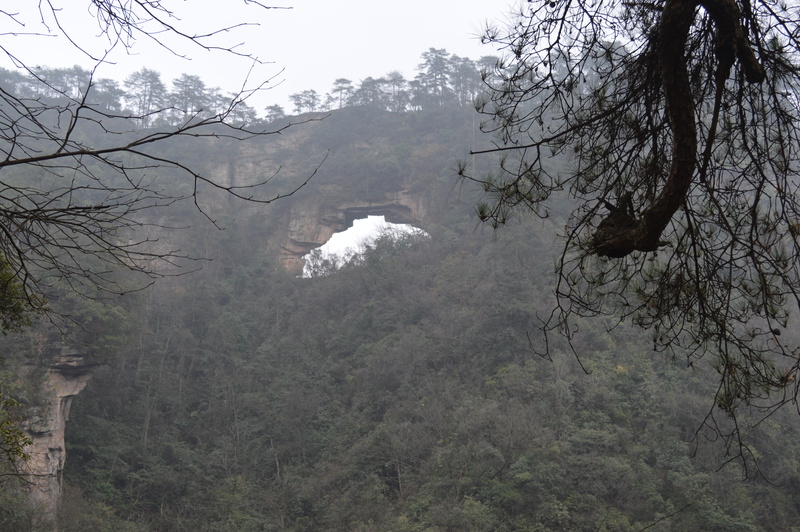 I was surprised that my legs hadn’t just dropped off after the previous day’s intensive hike when I woke up for my second day at Zhangjiajie Forest Park. It was probably a good thing considering I still had two more days of hiking to go. I did intend to take the second day a bit easier though, which I did. The temperature had now plummeted – it felt more like January than March. It was good practice for hiking in the less than ideal weather conditions in the UK when I get back home. Shivering a lot more than on my normal treks, I headed to the Wulingyuan entrance, this time heading to the bus station at Water Winding Four Gates. I spent the first hour taking a leisurely stroll along the Golden Whip Stream before heading up 2000 steps towards the most touristy section of the park. 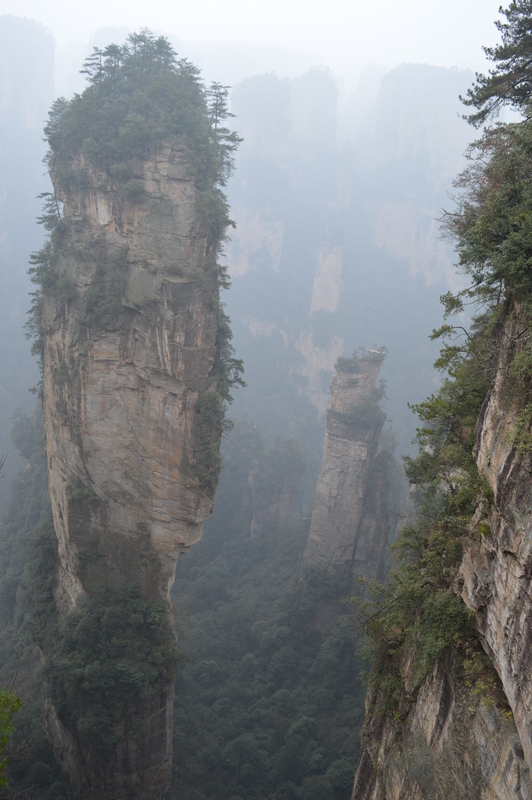 Yuanjiajie is the most crowded section of the park, most probably because this is where you get an up-close view of the ‘Avatar’ peaks which inspired the setting of the movie, such as the amazing Heaven Pillar. In contrast to the mostly deserted hike from the day before, this was filled with shrilling Chinese tourists and tour guides with megaphones. This intensity didn’t detract from the incredible views though and, after the steep climb up (which was a lot quieter as most people take the elevator), the walks were easy. After wandering round here, I ended up at Yuanjiajie bus station. From here, I walked to the right down the road towards the famous elevator. You can take the bus and the 20 minute walk down the road wasn’t the highlight of my trip but it was empty and it was nice to finally be away from people. At the end, I reached Bailong Elevator which transports tourists from the lower section of the park to the top points. It also happens to be the highest elevator in the world. With the cable car out of action, it’s the only hike-free way to get up and down in the park and I decided to give it a go as it’s one of the iconic experiences in the park. By flashing your student card, it costs 43 yuan one way. Most people travel upwards in it so when I headed down, I got the entire lift to myself. It was a pretty cool experience and unlike anything I’d done before. It’s a weird feeling hurtling down amongst the incredible peaks – certainly a unique experience. There’s a bus station right at the bottom from which you can get a free bus back to the Wulingyuan entrance. That evening I ventured out into the town to find a restaurant in which to eat. It turned out to be a bit of a disaster as the owner of the place I went to seemed determined to make me buy his most expensive produce. When I said no and pointed to a different picture, he brought all the food out anyway (I ate one of the dishes, thinking it was the one from the picture – turned out it was the expensive dish!) and then obviously charged me for them all. We essentially ended up in a stand-off as I refused to pay the full amount, though one where neither of us could communicate with one another because of the language barrier! Things got a little dramatic when they got someone to guard the door to stop me leaving and he seemed itching for things to kick off. Eventually though, we were able to settle with me getting a reduction, though I was adamant I was going to get jumped on as I left. Always check the bill as you order, folks! It was now my final day in the park and after a touristy experience the day before, I opted for a more ‘off the beaten path’ hike today, trekking through Yaozi Village in the cold and rainy weather. It was certainly quieter. I saw about three or four other walkers throughout my hike and there were no food stalls or tacky souvenir shops here. Incredible sights worth seeing in this section include the striking Heavenly Bridge which was an unexpected gem. You also get some cracking views of the peaks without the mass of tourists around you. Following the signs to the ‘Top of the Village’ leads to some particularly stunning lookouts. This section is also littered with monkeys. They make for cute photos but they’re also vicious little buggers (as anyone who’s driven through the monkey section at a safari park can vouch). At one point, nobody was about and I opened my bag to have a drink and snack. Suddenly, about five monkeys leapt out of nowhere. I had one clawing at my leg and one was clinging onto my bag. It took a quick sprint and a lot of swearing to get rid of them. Don’t be fooled by their angelic faces. 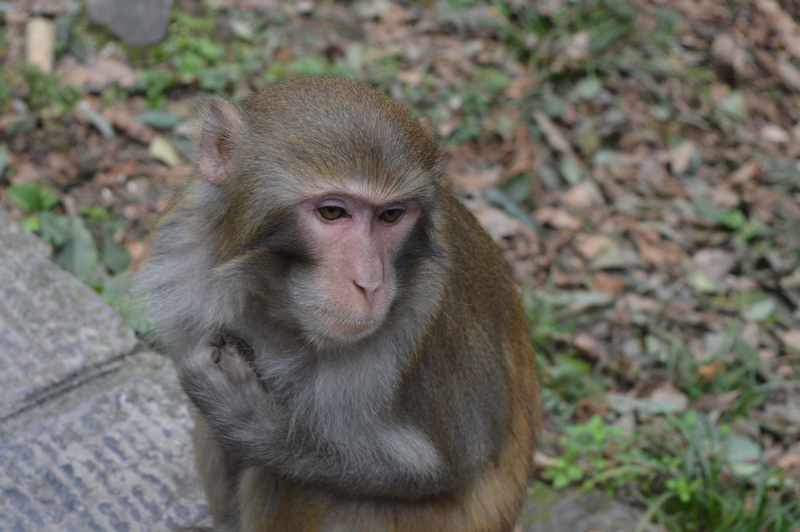 Monkey attack aside, my final day was a chilled out but tiring experience and I rounded it off with a tasty Chinese meal (in a restaurant where I wasn’t scammed) and preparing to head back to Zhangjiajie catch my sleeper train to Guangzhou. There’s not one part of me that regrets coming to this stunning part of the world. How something so incredible can be off so many people’s radars is a mystery to me. But then, maybe that adds to its charm.